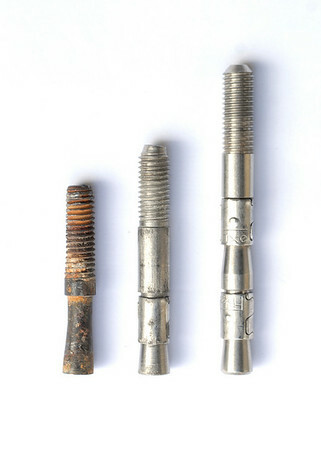 Here is the Fine Line bolt alongside the current offerings from Fixe. The bolt in the middle is a 2.75" wedge bolt (considered totally solid in Sierra granite but sketchy in soft sandstone), while the right-hand bolt is a 3.75" double-wedge. Notice that on the pulled bolt, the expansion clip is gone. Like previous removals, when the bolt was pulled, the expansion clip simply slid over the end of the expansion cone and still resides in the rock.